I think you can be forgiven if you, as I did, think that a film called Tunes of Glory was bound to be a musical. Truthfully, it’s a reason I haven’t been that keen to track it down. I mean, I knew I’d get to it eventually, but I wasn’t necessarily on the lookout for it. Still, the Oscar list is getting smaller and smaller, so there are fewer places for odd films to hide. When this showed up from NetFlix, I figured I’d roll the dice and hope that at least the songs would be good. Well, Tunes of Glory is not a musical. It’s also not a war film despite taking place virtually entirely within the context of a military battalion. It’s also not quite a character study, although in some ways it would very much like to be. While it’s not a story that would be classified as a war story, it is about a war of wills between two men who are broken in very different ways. We will be spending our time in an unnamed Highland Regiment in the time just after World War II. When the film opens, the commanding officer is Major Jock Sinclair (Alec Guinness), who has been running the outfit since the battalion commander was killed in action. The night the film opens is Sinclair’s last night in the position; he is to be replaced by someone more appropriate for peacetime. That new commander is Colonel Basil Barrow (John Mills). The two men could not be more different. Sinclair started in the regiment as a piper and worked his way through the ranks, winning several medals in the war. Barrow came to the regiment from Oxford, having spent some time in it before transferring out and eventually spending time in a Japanese POW camp, an experience that has affected him in terrible ways. While there is a veneer of respect between the two men, it’s soon evident that Sinclair has no respect for his new commanding officer. 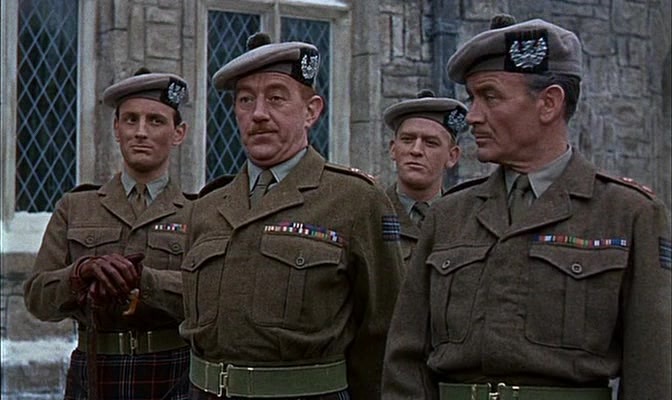 It’s also worth noting that Sinclair has a daughter, Morag (Susannah York in her screen debut), who is carrying on an illicit affair with Corporal Ian Fraser (John Fraser), an enlisted piper in the unit. While Sinclair encourages his men to have less than honorable intentions with the local women, he attempts to keep his daughter away from the regiment. Both Morag and Ian know that discovery of their romance will have serious consequences. Meanwhile, Sinclair has a sort of vague relationship with Mary Titterington (Kay Walsh), a local performer. The bulk of the drama here comes down to a couple of facts and one incident. Sinclair, having led the battalion in war, has the respect and loyalty of the other officers. Since Barrow is a by-the-book officer, the two immediately clash. Barrow even wants the officers in the unit to take dancing instruction to help with the relationship with the locals, a fact that greatly angers the officers, who feel that their own style of Highland dance is perfect fine. So, from the start, Barrow has a huge uphill road in achieving loyalty from anyone other than his adjutant (Gordon Jackson). The incident comes when Sinclair discovers Corporal Fraser with Morag. Incensed at both of them, Sinclair punches the young man. That may not sound like much, but since both were in uniform and in public, an inquiry must be made—an inquiry that will, by force of law, ending a court-martial. For Sinclair, this could put an end to his career in the military. For Barrow, this is yet another issue over which he will clash with his officers, further undermining his authority and leadership. While Tunes of Glory in terms of its plot is more or less just a scenario with character archetypes thrown into it, it is a movie that works entirely on its performances. The story is just a power struggle between two men, neither of whom is specifically the man that he thinks he is or the man that he wants to project to everyone else. While many of the performances are good throughout, it is Guinness and Mills who have to carry the entire film on their backs. Of the two, and this is a strange thing for me to say, it’s Mills who is better here, and this comes from someone who fully believes that Alec Guinness once gave one of the five best performances in film history. Guinness is hampered by having dyed-orange hair and by being forced to adopt a “Hoots mon!” version of a Scots accent, something he does tolerably well, but which feels so out of place. It’s Mills who is far more sympathetic here. Beyond that, the screenplay seems to forget that there are other issues going on here. After the confrontation in the bar, Morag more or less disappears from the film, her function having been completed. There’s more going on there, and so a great deal of the story seems unfinished, or as if it merely happened to drive us into the third act. Tunes of Glory is a good film, but not a great one. It’s not anything anyone needs to go out of his or her way to see, and not something I think needs to be seen twice. Why to watch Tunes of Glory: A clash of wills. Why not to watch: You've never heard this much bagpipe. Actually, it's all about the tunes of glory for the funeral ... the rest is simply the prologue. That's a completely fair assessment.